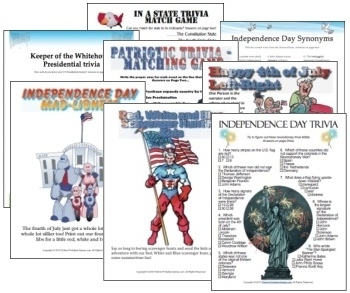 This July 4th songs trivia quiz is a fun icebreaker game for a July 4th party or any American patriotic event. Read each lyric portion given below. 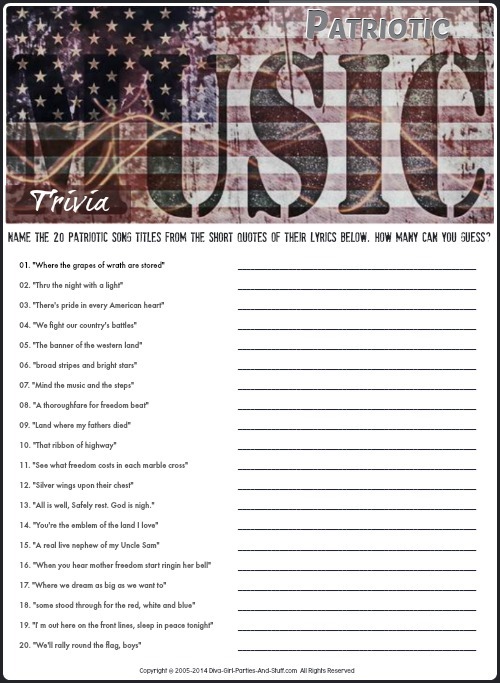 Ask your guests to name the titles of the 20 American patriotic songs noted on our list or create a list of your own to challenge them with. You can also add an extra element of difficulty or the potential for bonus points by asking for the name of the author of each song. You can find the song titles and song authors at the bottom of this page. HAPPY 4TH OF JULY! HAPPY MEMORIAL DAY! 01. "Where the grapes of wrath are stored"
02. "Thru the night with a light"
03. "There's pride in every American heart"
04. "We fight our country's battles"
05. "The banner of the western land"
06. "broad stripes and bright stars"
07. "Mind the music and the steps"
08. "A thoroughfare for freedom beat"
09. "Land where my fathers died"
11. "See what freedom costs in each marble cross"
12. "Silver wings upon their chest"
13. "All is well, Safely rest. God is nigh." 14. "You're the emblem of the land I love"
15. "A real live nephew of my Uncle Sam"
16. "When you hear mother freedom start ringin her bell"
17. "Where we dream as big as we want to"
18. "some stood through for the red, white and blue"
19. "I’m out here on the front lines, sleep in peace tonight"
20. "We'll rally round the flag, boys"